Novotel Ambassador Doksan offers a special outdoor BBQ party guaranteeing an exotic experience with specially selected fresh vegetables, seafood, meat and more. The BBQ also features various salads, appetizers, pasta, deserts plus a special live performance every night. 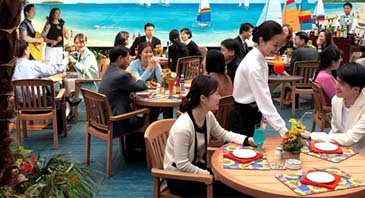 The special outdoor BBQ, from May 8 though September, offers a great spring night mood with buffet featuring freshest vegetables, seafood, meat along with salad, appetizer, and fried rice. Also available are free unlimited draft beer and beverages. Join at Garden Terrace and enjoy the exotic outdoor feast with Mexican acoustic live performance. Prices are 30,000won and 19,000 won for adults and children respectively.